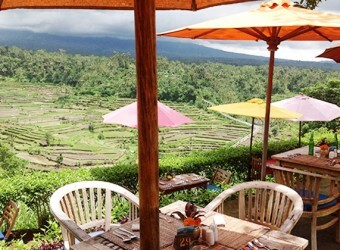 Bali Restaurant The Mahagiri Resort is located in rendang Village, Karangasem. The spectacular view of mount Agung, Bali's most famous holy mountain and the world most extraordinary rice terraces is breathtaking. The restaurant is always open and serve the freshest food mostly grown locally. With their "Back to Nature" concept we welcome you to Mahagiri Resort.